Traveling for some is passion, while for others, it may just be a gateway to gratification and peacefulness. When some voyage across the globe to get out of their comfort zones and eventually find themselves in the due course, others get into the travel mode with the intent of leaving their present behind and forgetting everything else, even themselves. Having said that, it’s imperative to acknowledge that it’s that time of the year again when most people excitedly pack their bags and head out with electrifying travel ideas brewing in their minds. And if in case, you are amongst those who have zeroed in on Thailand as your next destination and are wondering how to make the most of your holiday this year, then this is exactly what you need to read today. Our most excellent team of trip planners has drafted a distinguished list of five places near Thailand that are simply exquisite and an absolute value for money. Simply read on to find more. Though Chiang Mai is the second largest city after Bangkok, it has managed to keep the city’s frenzy at bay by providing a rather zen-like vibe that spreads tranquility in the air. With more than 50 flights leaving daily from Bangkok, Chiang Mai offers affordable accommodation and superb amenities. There are also night markets, Muay Thai boxing, and Wat Chedi Luang, along with the Bo sang HAndicraft Centre and the Elephant Nature Park that must not be given a miss. Take a Honda CRF on rent and explore this amazing city on your two-wheels. Thankfully the enthusiastic tourism has shown the wisdom of looking beyond Phuket and have acknowledged Phuket as a gateway to numerous other island resorts. One of them being Koh Phi Phi that owes a majority of its popularity to the globally loved movie- The Beach. A 45-minute speedboat ride from Phuket and a 90-minute long ferry from Krabi will swiftly take you to Koh Phi Phi, a collection of six islands that allows its visitors to immerse in the tantalizing beauty of amazing bays and beaches. Head towards it’s two prime spots- Phi Phi Don and Phi Phi Leh that are the hedonists’ paradise and you would simply fall in love with the experience. Krabi is one place which is rapidly gaining momentum in terms of its grandeur and popularity. Its magnificently unique geography, marvelous limestone cliffs, and beauteous caves and waterfalls make Krabi look absolutely dazzling. The amazing jungle-covered interior, sugar-white beaches, and numerous water sports with a variety of activities such as kayaking, rock climbing etc, shall surely keep you happily occupied in Krabi. Just don’t forget to take along your personal Courvoisier to further enhance the quality of your stay. To add a little touch of adventure one can extend towards the wildlife preserve Khao Sok National Park. 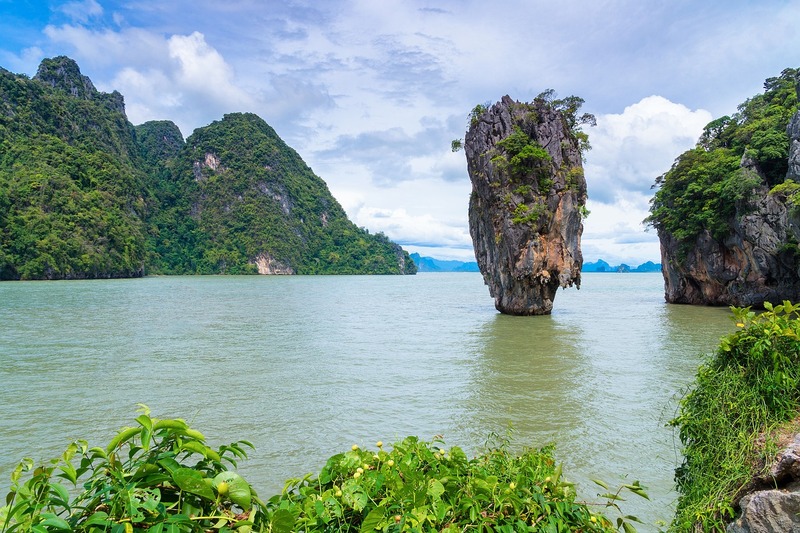 You can also hop on to James Bond Island to feed your nature-loving soul. With a mere two-hour drive or short boat ride from Phuket or an 80-minute flight from Bangkok, you can easily hit Krabi where an experience of a lifetime awaits you. Situated in the Krabi area of Thailand, Railay is a favorite amongst the tourists. As you breeze in the place on a boat, you’ll be welcomed with a breathtaking view of limestone mountains standing tall on icy-blue waters. A hiker’s fantasy, Railay has 4 beaches that are all easy to reach. While West Railay offers food joints and accommodations, East Railay entertains more of backpackers and hikers. If it is hiking that interests you, then its advisable to not miss Tonsai which is regarded as a hub for rock climbing and backpacking. Finally, cave swimming in Phra Nang beach, hiking to the Railey viewpoint concluded with a beautiful sunset with a bottle of awesome dimple pinch in hand is something you would remember for a long time! Ayutthaya is a city providing a rich heritage of the place’s magnificent history and culture. As per the studies, it is believed to have been found in c.1350, only to be later destroyed by the Burmese in the 18th century. What you’ll find here today is what remains of its incredible past that has been duly restored and protected by UNESCO. Ranging from the statues of seated buddhas to headless ones, Ayutthaya promises to provide you with an enchanting insight into its rich history. Since Ayutthaya is quite a spread out place, it would be a wise choice to explore the ruins on a hired bicycle or a tuk-tuk. With awe-inspiring beaches, luxurious resorts and world-class cuisines, Thailand has emerged as the most sought-after holiday destinations by a major fraction of the masses. But the extravagant beauty of Thailand extends much more than just that. It is advisable to not let the boundaries speak for you. Instead, get on there and let nature surprise you with its impeccable wonders. I’ve visited 4 out the 5 and I must say that you’re description is a bang on snippet of what you’ll see in these cities. For me, Phi phi will always remain a favourite! I must explore Railay as well! I have not been to Thailand yet. After reading your post I would love to visit sometime soon. I love history… So, Ayutthaya is a place I would love to visit! Krabi and koh phi phi are also extremely beautiful!